Australian beef is popular for its premium quality worldwide, available as grass-fed or grain-fed livestock. 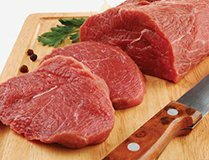 Depending on the importers requirements, Al-Ghani can source beef in any weight range, in various cuts, of different grades, suitable for food manufacturing industry or supermarkets. For a supreme culinary experience, you can’t miss an Australian beef steak!